In recent years an increasing number of people have become interested in Victorian style and this includes Victorian decorating. It is not too hard to give your home a Victorian look but it is not a cheap way of doing things. Although people are interested in using Victorian decorating styles in their homes they don’t want to go the whole way – so other than a few eccentrics or English stately homes don’t expect to see the Victorian kitchen with the kettle hanging over an open fire. Most people who favor Victorian decorating have fitted kitchens, some have them made in natural wood but this is about the only concession. Some aficionados may have a plant on the kitchen window ledge and pans hung from hooks. Victorian style was quite ornate and because of the hypocritical Victorian morality even the tables had to have their legs covered – in some homes the chair legs were also hidden by a sort of valance. The Victorians made great use of wallpaper and again this was quite ornate, often sporting a flowery pattern. The mantle over the fireplace was also kept covered during the Victorian era but very few people choose to do this today. The Victorians liked their furniture to be well stuffed, usually with horsehair. Most of the chairs had upright backs and there has been a rise in the number of people favoring this type of chair. If you are going for a Victorian Decorating style then you would do well to remember that they liked heavy drapes. This was because they were not just seen as window decoration but were used as a way of keeping the draft out (no double-glazing) and the room warm. They were often accompanied by heavy lace curtains underneath. Many Victorian homes had lots of books and ornaments. It was not unusual to see a side table that was completely covered in framed photographs. You can still get hold of genuine Victorian chairs and tables with their ornately carved legs but as they become more popular so the price gets higher. Another favorite from the past in this style of decorating is the grandfather clock. Modern examples of this are quite good though it is possible to find an original – again at a price. Beds were ornate and made of wood or cast iron with bolsters, a sort of long pillow, and often two pillows as well. The sheets and blankets were covered by an eiderdown quilt for extra warmth – no duvets for the Victorians. It was usual to have a jug and bowl on the dresser for the morning wash. 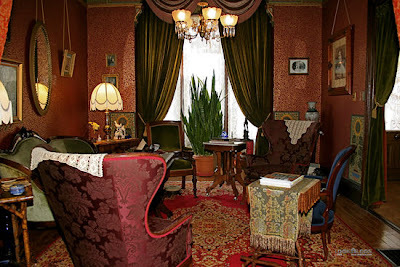 Most people who try Victorian decorating don’ t go the whole way – it is just too fussy for modern life. However, the Victorian style wallpapers, curtains and chairs are increasing in popularity.